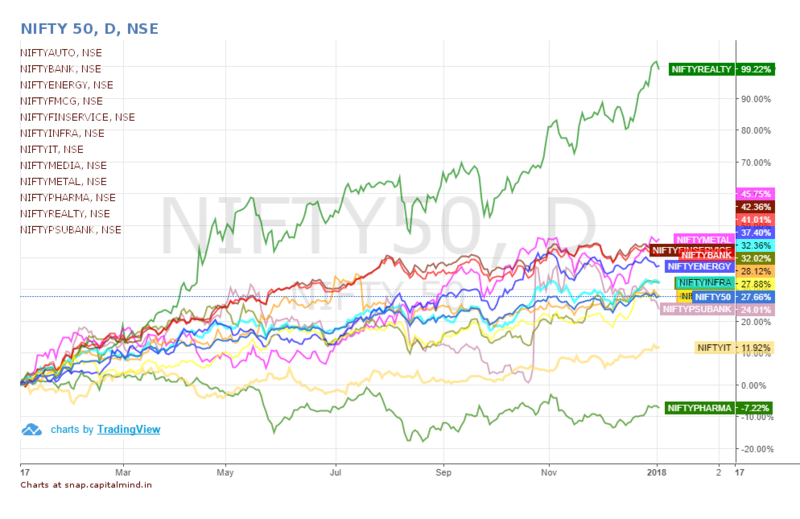 The broad based Nifty 50 Index returned 27.66% in the last calendar year. While different sectors performed at different scales, we bring to you the holistic view of performances of different indices. Realty is seeing its old glory days again. Which is strange because house prices are actually stagnant or falling in most metros and sales seem to be slowing. 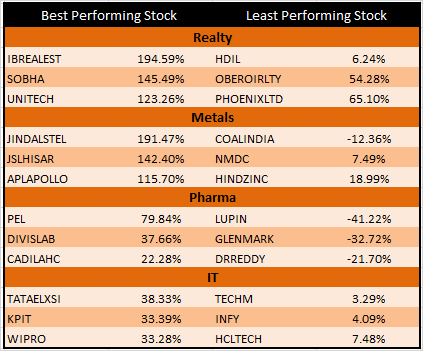 Realty stocks have almost doubled in last one year. 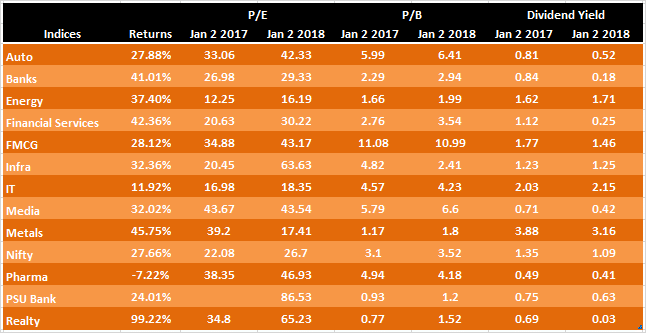 The worrying factor being will it turn out to be a bubble considering the P/E of the index has almost doubled and earnings remained at a flat level in last one year. All the hype coming in with smart cities and infrastructure spending by the government, low interest rate coupled with policy changes with RERA. But on ground very little is happening at the moment. Things might start looking down if hype is not matched by the underlying growth . But yes prices are only to cheer as stocks appreciated by 10.5% on a 12 month scale. Ibrealest and Sobha has been riding high and have given 195% and 145% returns in the last calendar year. Better pre-sales and EBITDA margins coupled with higher future cash flows ( from pending collections) from the ongoing projects have triggered the rally. Higher inventory along with gradual slowdown in luxury housing segment is a cause of concern. Note: Returns are from the period of 02 Jan 2016 to 02 Jan 2018. Metals have been on the run for last two consecutive years now. In calendar year 2016, Metals bagged the top performing Indian Index by posting 43.72% return. And again in 2017, metals have given 45.75% returns. Things have been turning around. Anti dumping (4%) duty has proved to be a major relief at the beginning of the year and the production cut from China has given a much needed hope for the domestic steel companies. Crude steel production rose by 5% to 92 million tonnes from Jan 2017 to November 2017. India has become a net exporter of steel this year with 8.9 million tons of exports compared to 6.6 million tons of import in 10 months of calendar year 2017. Most of the steel firms have turned EBITDA positive after a long time. With global demand showing anuptick and production cut from China due to environmental issues, we could see domestic firms in a right trajectory. JSW and JSL Hisar are the players which can take maximum benefit of the higher demand. 30% of the banking NPAs are from the steel sector and most of the firms are over laden by debt. JSW and JSL Hisar have least debt on their books compared to Industry. With recovery in domestic prices, EBITDA margins improved. Value addition and increased branding have pushed the sales. Pharma is lagging for the second consecutive year in a row. Pharma index is the only index to give negative returns this year. An investment in Pharma in calendar year 2017 would have seen the investment down by 7.22%. The high margin US market is reeling under pricing pressure, lack of API approvals has also been slowing down pharma companies growth. Increased R&D costs coupled with stringent FDA inspections have hurt the booming sector. There is also an undergoing consolidation with mergers and acquisitions. Newer markets are not able to substitute the downturn in US and Europe. While the sector is undergoing correction, it will take time to normalize. Lupin has fallen more than 40% since the start of the year. It has received import alert for its Goa and Pithampur plant in second half of the year. Lupin US Sales contribute more than 35% of its global sales. And for the last 12 months the sales of US has gone down by more than 30%. Lupin went ahead with 14 acquisitions from FY08 to FY17. The revenue contribution of acquired companies stands at 19% (except Gavis and Temmeler ) of consolidated revenue, but at PAT level they just contribute 4%. Its recent foray in Japan is yet to yield results, otherwise its just and watch game. IT which grew multi fold in last couple of decades has lost its luster. The NIFTY IT index gave just 11.92% returns in calendar year 2017 (considering NIFTY gave returns of 27%)Stricter Visa norms have pushed IT firms to hire more US based employes, which is shooting up their overall cost. Apart from that slowing global banking and financial sector has been making it hard for the IT companies to improve their cash flows. Sluggish offtake in large deals and also stronger ruppee has posed to be a significant hurdle in the segment. Tech Mahindra has seen its profitability hit in the last 18 months. Restructuring of LCC and lower rate in signing large deals has been the major area of concern. While telecom is on a gradual road of recovery, but it has already made a dent on Tech Mahindras profit. To add more to its woes the Stricter US Visa regime has added more cost to its operating profit. Tech Mahindra has been undergoing cost optimization and reducing the employee head count and trying to align itself to pyramid employee structure. It’s incredible that the two biggest performers – Real Estate and Metals – are also among the top companies to be in bankruptcy. For steel, the recovery seems real, but remember that steel plants in China are only closed till March. Will they come back in style? Will the JP Infratech unwinding lead to the change in view for real estate stocks back down? We’ll never know for sure till it happens. But the leaders of this year might surprise us entirely, and while the old guard looks interesting, the growth might actually come from a place none of us can imagine right now. To great investing!